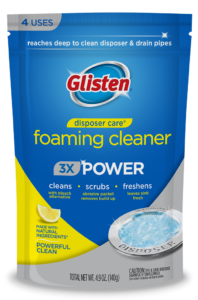 Glisten® Microwave Cleaner with Foaming PowerTM is designed to clean away stains and baked-on food. The scrubber foams and steams when heated, softening any built up messes inside your microwave. That makes it fast and easy to wipe them away without scrubbing! When you’re ready to take on the mess in your microwave, simply heat the scrubber to activate its foaming power. Wipe away food and spots with the hardworking scrubber to reveal your clean, fresh-smelling and stain-free microwave oven. Glisten is safe for use in any microwave and helps to maintain a smooth running machine. 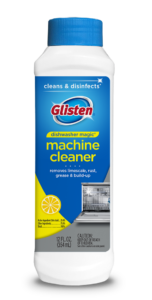 Glisten Microwave Cleaner is made with natural ingredients, providing a powerful yet safe clean. This innovative microwave cleaner foams to steam away tough baked-on food, eliminating the need to scrub built up messes and stains. Glisten works in all microwaves. How Often to Use: Use as needed to remove interior buildup and stains. Non-Compatible Surfaces/Materials: Glisten Microwave Cleaner is safe for all microwaves. Remove scrubber from pouch and place in microwave. Heat on high for the time indicated in chart. Do not heat longer than indicated. Scrubber will foam when heated. Let stand for 3 minutes with door closed to steam and soften baked-on food. Open door carefully. Confirm scrubber is cool to the touch. Wipe surfaces clean. Wipe away residual foam if necessary with a paper towel or damp cloth. Your clean microwave is now ready for use! Do not mix with any other cleaner or chemical. 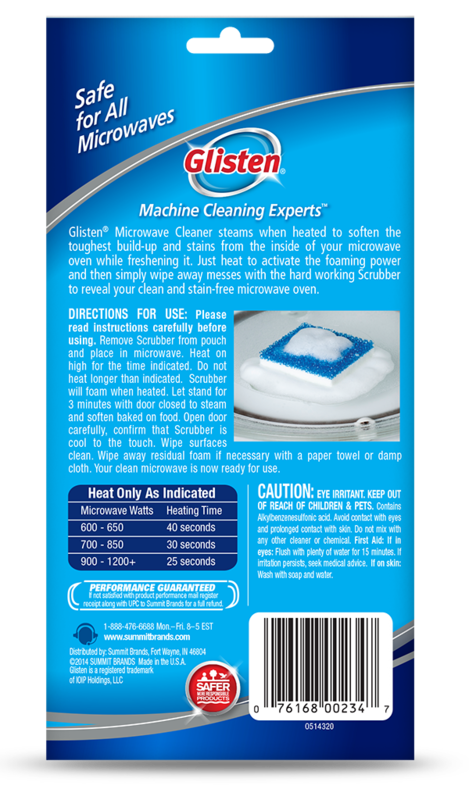 + What does Glisten® Microwave Cleaner do? 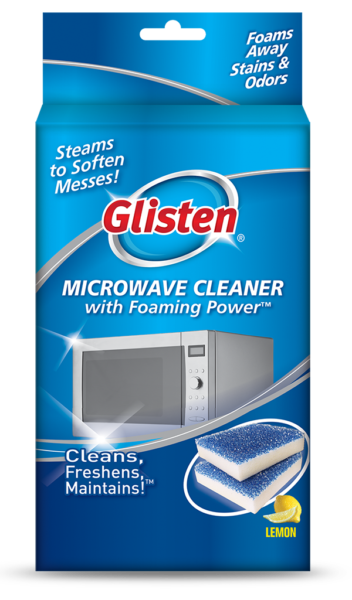 Glisten® Microwave Cleaner’s foaming power steams when heated to soften the toughest buildup and stains from the inside of the microwave. The hard working scrubber wipes away messes, eliminating the need to scrub tough baked-on, difficult-to-remove food. Glisten cleans, freshens and maintains a smooth running machine. 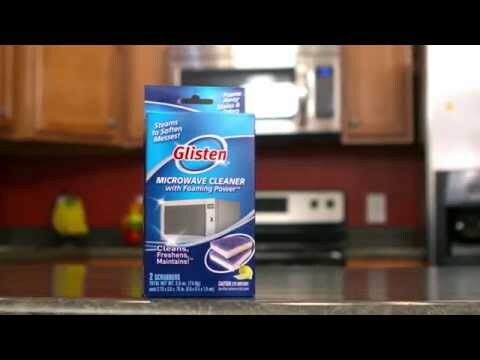 + Where can I buy Glisten Microwave Cleaner? + How do I use Glisten Microwave Cleaner? Please read instructions carefully before using. Heat only as indicated by chart on label. Remove scrubber from pouch and place in microwave. Heat Scrubber on high for the time indicated. Do not heat longer than indicated. 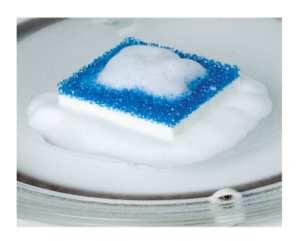 Scrubber will foam when heated. After heating cycle, leave scrubber in microwave with door closed for 3 minutes to steam and soften baked on food. Open door carefully, confirm that scrubber is cool to the touch. Use scrubber to wipe surfaces clean. If necessary, wipe away residual foam with a paper towel or damp cloth. Your clean microwave is now clean, fresh and ready to use. + How long should I wait before I remove Glisten Microwave Cleaner from my microwave? We recommend waiting 3 minutes before removing the scrubber, which should allow it to cool and be safe to touch. This amount of time also allows the cleaning foam and steam to continue softening buildup and stains, making it easier to wipe away. + After using Glisten Microwave Cleaner and scrubbing the walls to remove the stains, there was a large amount of foam. What should I do? Any excess foam can be removed by dampening a sponge, cloth or towel with water and wiping down the microwave interior. + How many uses can I get out of each scrubber? Each scrubber is designed for a one-time use. + Is Glisten Microwave Cleaner safe for all types of microwave ovens? When used as directed, Glisten Microwave Cleaner is safe for use in all types of microwave ovens, including stainless steel interiors. + I had formula residue on my hands after using Glisten Microwave Cleaner. Is it dangerous? Excessive contact is not recommended, but handling the product for the instructed usage is not harmful. After using Glisten Microwave Cleaner, it is recommended that you wash your hands with soap and water. + Will Glisten Microwave Cleaner leave chemical residues that will cling to food that I prepare in the microwave? If used as directed and properly disposed of, Glisten Microwave Cleaner will not leave residual chemicals in your microwave. + Will Glisten Microwave Cleaner leave a strong scent after use? Glisten cleans the interior and removes odors, leaving a fresh scent. + How do I dispose of the scrubber after use? To dispose of the scrubber, simply discard it into the trash. + Should I remove the glass plate from the microwave interior when using Glisten Microwave Cleaner? Glisten Microwave Cleaner is designed to safely clean all microwave interiors, including the glass plate. Glisten will steam and foam away stains, buildup and odors from the interior as well as the glass plate.